Buy online DAC0808 8-bit DAC in India at low price from DNA Technology, Nashik. Online source for electronic components. DAC0808 is a 8-bit Digital to analog converter (DAC). It can be easily interfaced to Microcontrollers like Microchip's PIC series, 8051 series, Atmel's AVR microcontrollers. It can also be used with Arduino and Raspberry pi. level output current of less than 4 µA provides 8-bit zero accuracy for IREF≥2 mA. The power supply currents of the DAC0808 is independent of bit codes, and exhibits essentially constant device characteristics over the entire supply voltage range. The DAC0808 will interface directly with popular TTL, DTL or CMOS logic levels, and is a direct replacement for the MC1508/MC1408. 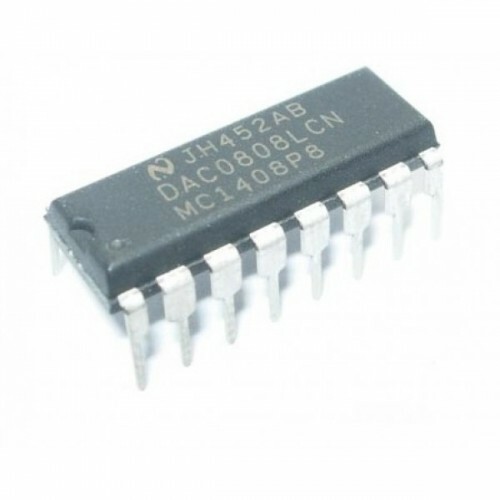 MCP4821-12bit Digital to Analog ConvertorMCP4821 is a single channel 12-bit Digital-to-Analog conver..